In a cheap Parisian hotel room Oscar Wilde lies on his death bed and the past floods back, transporting him to other times and places. Was he once the most famous man in London? The artist crucified by a society that once worshipped him? The lover imprisoned and freed, yet still running towards ruin in the final chapter of his life? Under the microscope of death he reviews the failed attempt to reconcile with his long suffering wife Constance, the ensuing reprisal of his fatal love affair with Lord Alfred Douglas and the warmth and devotion of Robbie Ross who tried and failed to save him from himself. From Dieppe to Naples to Paris freedom is elusive and Oscar is a penniless vagabond, always moving on, shunned by his old acquaintances, but revered by a strange group of outlaws and urchins to whom he tells the old stories - his incomparable wit still sharp. 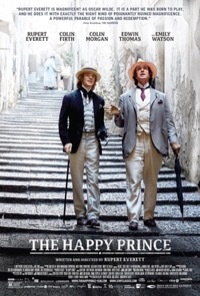 THE HAPPY PRINCE is a portrait of the dark side of a genius who lived and died for love in the last days of the nineteenth century.